The seats at London Bridge station, that I wrote about in Matched Seats And Roof At London Bridge Station, have now been installed at Victoria station. Would they have amused Queen Victoria? This press release from Network Rail is entitled Network Rail Puts Passengers First With Installation Of New Modern Seating At London Stations, gives more details on the new seating. Seating capacity at each station will be increased from 150 to 400. The seats were made by Green Furniture Concepts from Malmo in Sweden. Generally, passengers I’ve asked, seem pleased with the new seats. The title of this post is the same as that of this page on the Network Rail web site. This image from the page shows the winning design. Obviously, it has several passenger friendly features. Safe steps with double-handrails on both sides and a take-a-break step at halfway. A covered bridge with good views of the station. But what I like about it are these design and manufacturing features. The width and height could be easily adjusted for different locations. Three- and four-platform bridges could follow the same theme. It could be built in a factory and just lifted in a few pieces onto a prepared site. Cost of an installation could be calculated on the back of an engineering envelop or fag-packet. I also think it is one of those good designs, that will inspire its users and perhaps prompt younger people to take up design or engineering as a career. If this standard off-the-shelf design or something like it or better was available, how many stations could be given step-free access in the next few years? As Network Rail sponsored this competition with RIBA, let’s hope they follow through their original initiative. 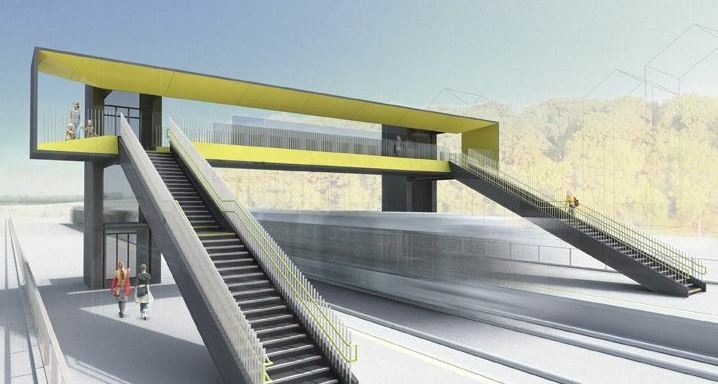 The footbridge could even have applications outside of the railway industry! This document on the Government web site is entitled Access for All: 73 Stations Set To Benefit From Additional Funding. It appears that £300million of additional funding will be used to create full step-free access at seventy-three stations. I have visited several of the stations and I feel that a standard bridge approach could benefit these stations. I shall add to this list, as I discover more stations, that are suitable. I took the spacious three-car Class 170 train from Cambridge to Newmarket. This Google Map shows the area, where the Cambridge to Ipswich Line via Newmarket leaves the main Cambridge to Ely route. 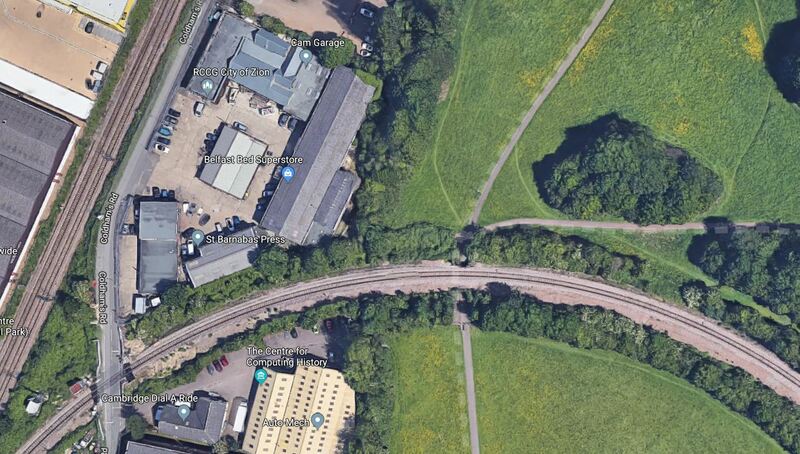 The Cambrifge-Ipswich line is the loop at the bottom of the map crossing the green space of Coldhams Common. These are pictures, I took as my train passed. The East West Rail Consortium have plans for this rail line. In this document on their web site, this is said. pursuing further doubling of the route via Soham. So would it be possible to fit, the required chord between the two railway lines? I suspect that a double-track chord would be preferred and there might be some extra tracks between Cambridge and Ely. This Google Map shows the area in more detail. Note the level crossing shown in my pictures. 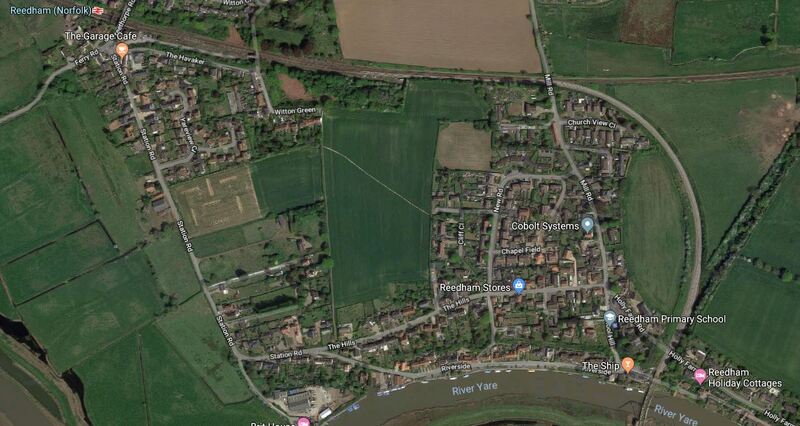 The main problems in the way of a double-track chord that would allow trains to pass between the routes to Ely and Newmarket, would appear to be the industrial Buildings and the level crossing that gives access across the rail line. But I don’t think that this will be the major problem, as industrial premises can always be relocated, especially if the compensation is good. I estimate that it is likely, that two heavy freight trains in every hour in both directions should be passing across the quiet green space of Coldhams Common. Would this be acceptable to the nearby residents and the users of the Common? The East West Rail Consortium are well funded and I suspect they have a cunning plan here, that could put a double track railway through this sensitive area. If the landowner of these industrial buildings happened to be Network Rail, that would surely help, as they would co-operate. There also appears to be very little housing alongside the Cambridge-Ipswich rail line. 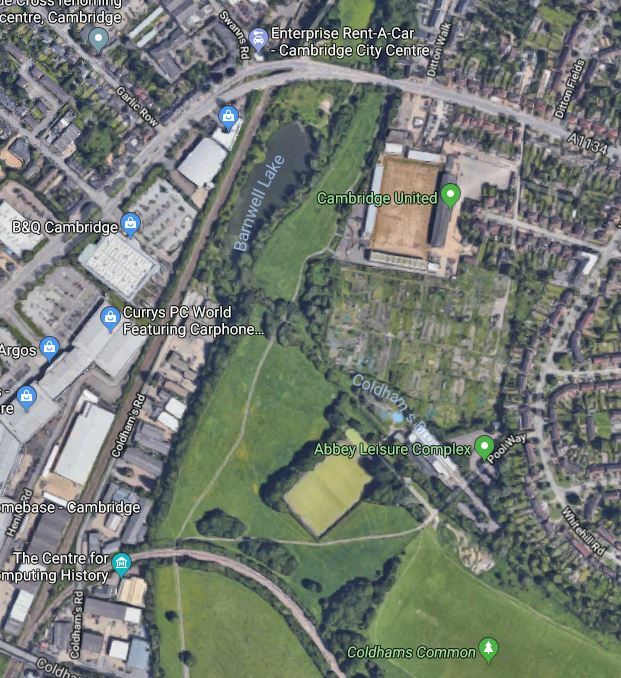 I could see a solution, where more of the industrial buildings than needed were removed and some of the land given over to extend Coldhams Common. Over the last few years, I have gone to perhaps half-a-dozen Ipswich-Norwich Derbies. Last season, I didn’t get to either match, as Network Rail, thought that these days were ideal to do engineering work on the Great Eastern Main Line. As if, there hasn’t been enough in the time since I’ve moved to London in 2010. Normally, I would have bought a ticket for the match on February 10th in Norwich at 12:00 in the morning. But I have just looked up the train times to get there for a match start at that time on a Sunday. The only service leaves Liverpool Street at 07:08 and arrives in Norwich at 10:12! It also involves an hour on a bus. I would probably arrive back home at around seven in the evening. I have other things to do, like getting something to eat and as a coeliac, I can’t just pop into the average take-away, unless I wanted to spend another three hours sitting on the toilet. Why is there no liaison between Network Rail and the two football clubs, so that essential work is done on less important days? To make things worse, on Saturday the 2nd, they’re getting the buses out again. So that’s another match I’ll miss! This season it has been easier to watch Away matches than Home ones. When are Network Rail going to stop treating regular travellers with such downright contempt? This article on the Railway Gazette is entitled UK Railway News Round-Up. Network Rail has awarded The Knowledge Academy Ltd a framework contract to provide project management courses for its employees. Have Network Rail finally accepted, that they have a project management problem? A major refurbishment of Sevenoaks tunnel has seen a 20% reduction in delays and halved journey times for passengers, even as the £21m infrastructure renewal nears completion. One of the longest tunnels in southern England, Sevenoaks has been given a major overhaul which has included replacing thousands of sleepers, laying several miles of news track, and installing new drainage systems. Sevenoaks tunnel is a single-bore tunnel, double-track tunnel about two miles long. Obviously, this refurbishment has been worthwhile. I do wonder how many other schemes, that are stuck in Network Rail’s pipeline would show similar improvements in the quality of the service? The title of this post is the same as that of this article in the Manchester Evening News. It had been feared the space would remain closed for years – but Salford Council say they will make sure it opens as soon as they take ownership. It is good news for those like me, who like interesting city walks. It is also time for Network Rail and Lewisham and Southwark Councils to sort out what is to happen around London’s new rail structure; the Bermondsey Dive-Under. This article on the Landscape Institute web site from 2017, is entitled New Railway Junction Gets Top Marks For Biodiversity., describes how the work at Bermondsey has won an award. This is said. The project involved removal of 21,900 tonnes of contaminated material and eradicated the Japanese knotweed. To increase biodiversity, wildflower planting and green walls were installed to offset vegetation lost in the process of removing the contaminated soils. The project includes 765m2 of green walls under arches and access ramps, and the planting of wildflowers on the railway embankments to create green corridors and stepping stones to the wider area. The team also carried out extensive community engagement, including upgrading the garden in the Lewisham Community Centre. I think there should be a public walking route through this area. The title of this post is the same as that of an article in the October 2018 Edition of Modern Railways. New NR Chief Executive Andrew Haines has commissioned work to understand options for capacity through platforms 13 and 14 at Manchester Piccadilly. It was originally planned to build two extra tracks, with additional platforms between Manchester Piccadilly and Deansgate stations, to improve the capacity over the Ordsall Chord. But various engineers and politicians have suggested that Digital Signalling may be an alternative solution. Speaking to the House of Commons Transport Committee, Mr. Haines said. We might be better off replacing some of those fleets of trains with trains which have more doors. Boarding is slow all across the North and I suspect Mr. Haines has studied the problem. He had commissioned work to understand if 15 trains per hour could be delivered through platforms 13 and 14 without major infrastructure works. I don’t think that Network Rail would waste money on a study, if they didn’t think that 15 trains per hour (tph) were not possible. Thameslink and Crossrail will soon be running 24 tph through Central London in four directions. The East London Line currently runs 16 tph in a tunnel that was opened only thirteen years after the Liverpool and Manchester Railway. Trains designed for short dwell times and easy boarding and unloading, as suggested by Mr. Haines would obviously help. Platforms and the related access at Manchester Piccadilly, Manchester Oxford Road and Deansgate stations would need to be improved. But that would be a smaller number of affordable projects. I do think Andrew Haines has a mind that doesn’t believe in boxes, so his ideas won’t go down well with those with big-spending conservative ideas like most rail union leaders, some rail company bosses and the Mayor of Manchester. This document on the Network Rail web site is entitled Highlights Of The Great North Rail Project. There is this section which is entitled We Build A Railway Station In Just Nine Months. It’s about the building of Maghull North station. Network Rail undertook the scheme on behalf of Merseytravel, appointing contractor Buckingham Group. How did we deliver the station so quickly and carry out most of the works while keeping the railway line open? A head start, line access and a tight summer deadline. I also put it down to the Liverpudlian attitude, which in my experience seems to accept disruption to their lives without complaining too much and then joke about it, when it’s all over. I was in Liverpool during the bus strike of 1968. where Liverpudlians just walked. Some of this attitude would be of great help in sorting the problem of the Steventon Bridge in Oxfordshire. I wrote about this bridge at the end of The Stone Arch Railway Bridges Of Scotland.